If you want an arrangement that is simple, elegant and long lasting, this is it. This arrangement is made with two inches of water, but later I took the water out and let the Sea Holly dry. You can even make this arrangement with no water. The purple green Amethyst Sea Holly is sandwiched between layers of plate glass. The vase is very tall and thin with crisp corners. You can see the thickness of the green glass edges as they come together and define the perimeter of the vase visually. It almost looks like it could be a museum display case. You can buy a vase like this (click here) This one is really unique. You will not find a vase like this in any store. Once you have you vase and your Sea Holly you are ready. Let's begin. Add 2 inches of water unless you want to dry the Sea Holly. Wrap kitchen towel around a yard stick. Carefully wipe off water drops inside vase. You will use 3 pieces of Sea Holly. Cut Sea Holly on an angle at 14.25 inches. 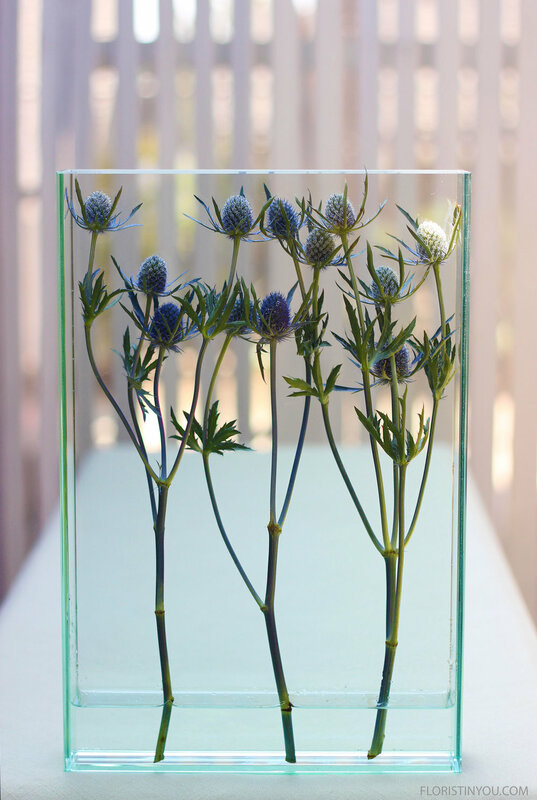 Place your Sea Holly in the vase.